Can you feel the Super Bowl energy in the air?? I sure can! So I'm having one of my favorite bloggers, Shandra from Deals to Meals, share the all-star lineup of perfect Super Bowl foods…all using the same Best Basic French Bread recipe! Talk about a touchdown. In this post she'll show us her incredible Super Bowl Sandwich Ring (can you believe it's WAY easier than it looks?? True story). Take it away Shandra! I am excited today to share another simple way to turn my basic french bread recipe into something special. Who doesn't love a good, gourmet sandwich? My friend Alicia shared this recipe with me and I think it is such a fun and creative sandwich method for any party (hint, hint…Super Bowl is coming up). 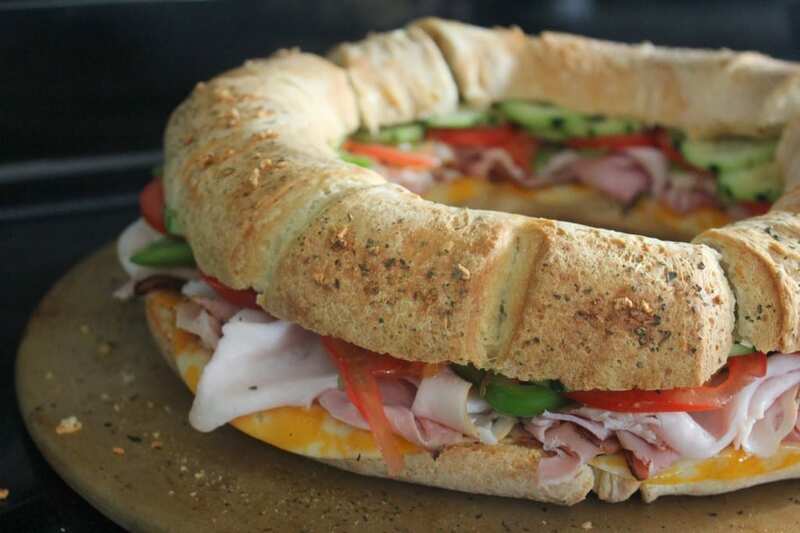 The sandwich bakes into this pretty ring shape and your guests are able to just slice off as small or big of a piece of sandwich they are looking for. Make the French bread dough and let rise in the oven for 30-40 minutes, or until the dough reaches the top of the bowl. Remove the dough from the oven and pour onto a slightly greased counter top. Cut the dough into half and set the second half aside (you can use the second half of the dough for a second sandwich or use for the pizza muffins). Form the dough into a long snake-like shape, about 2-3 inches wide. On a pizza stone or cookie sheet, form the dough “snake” into a circle. With a sharp knife cut shallow, diagonal slice marks every couple inches around the bread. Melt a half stick of butter and brush over the top of the dough. Sprinkle the dry Italian Seasoning mix generously on top of the bread. Let the bread rise until it has doubled in size and then bake in a preheated oven at 375 for 20-25 minutes, or until the top of the bread is lightly golden brown. Remove from the oven and let cool for a few minutes. Cut the bread horizontally in half, and remove the slice. Spread a generous amount of mayo on the bottom piece of bread. Place the sliced cheese on top, then the meat and then layer the vegetables on top of the meat. Prepare the remainder of the Italian seasoning mix with half the oil and vinegar that is called for on the packet. Drizzle the Italian dressing all over the top op the vegetables and meat. Place the top piece of the bread on top of the sandwich and serve. ENJOY! 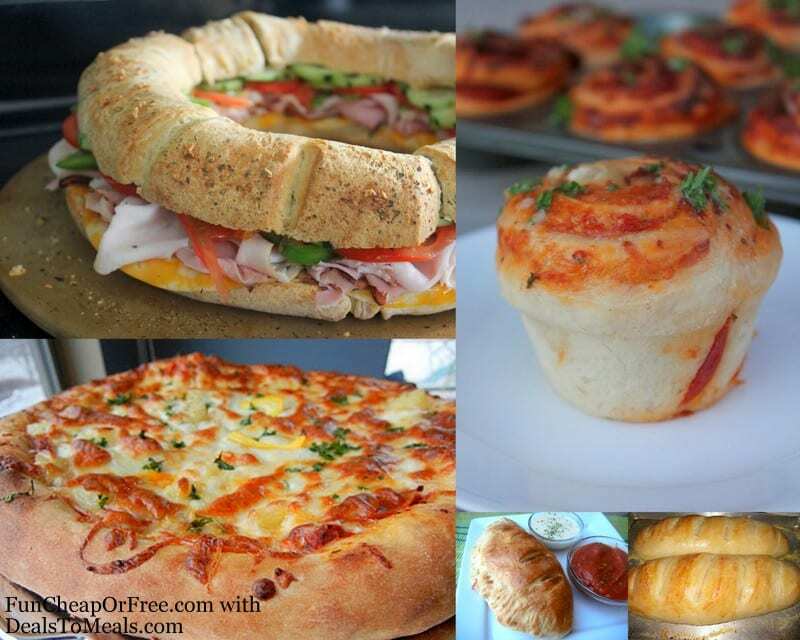 Pizza Rolls, Homemade Pizza, Pizza Benders (Calzones) and more!